Handmade and manufactured in Denmark in a local carpenter’s shop with beech wood and bright eye catching finishes of yellow and green, PLAY furniture is sure to capture any child’s attention. PLAY is part of New Danish Modern, Normann Copenhagen’s Danish furniture collection that fuses traditional Danish craft and modern design. Of his vibrant and colorful collection for children, Jesper K. Thomsen says, “Children’s furniture must be for children, rather than small copies of adult furniture.” PLAY is exactly this — furniture and play items that appear to have been pounded together in a garage with mom and dad, but with beautiful, clean and modern lines that hint otherwise. This homemade, randomly assembled look is all part of Thomsen’s design plan, and the result is cheerful and unique furniture pieces that are sure to be treasured by children and adults alike. 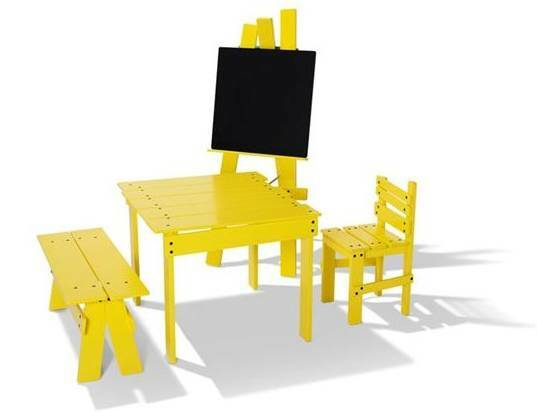 The PLAY line includes a table, chair and bench that work well together as a set, and two imaginative play items — a play board (or art easel) and a cleverly homemade looking classical soapbox cart. Thomsen’s aim with PLAY is to enable many happy hours of fun and discovery for families, and we’d say he went above and beyond with his delivery! 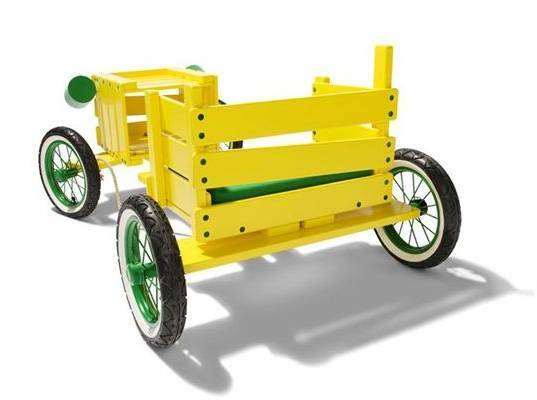 Handmade and manufactured in Denmark in a local carpenter's shop with beech wood and bright eye catching finishes of yellow and green, PLAY furniture is sure to capture any child's attention. PLAY is part of New Danish Modern, Normann Copenhagen's Danish furniture collection that fuses traditional Danish craft and modern design. Of his vibrant and colorful collection for children, Jesper K. Thomsen says, "Children's furniture must be for children, rather than small copies of adult furniture." PLAY is exactly this -- furniture and play items that appear to have been pounded together in a garage with mom and dad, but with beautiful, clean and modern lines that hint otherwise. This homemade, randomly assembled look is all part of Thomsen's design plan, and the result is cheerful and unique furniture pieces that are sure to be treasured by children and adults alike.